Gladinet is a solution based on Amazon’s S3 and/or other cloud vendors. It offers the simplest method for users as well as businesses to store their information in the cloud and to access it seamlessly through existing applications. We are going to work our way up to building cloud applications one step at a time. First, let’s consider Gladinet’s solution. While it is limited in what it can do, it has been made to look very much like what you are already used to, as it looks and behaves like an external USB drive or a network drive, only it’s physically in the cloud. Edition runs $39.99 for home use and $59.99 for business use. Volume and academic licenses are available. 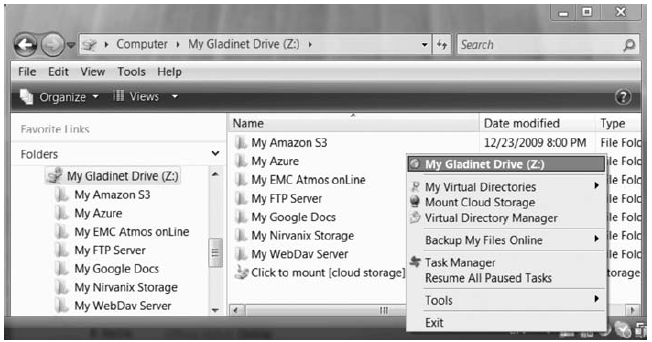 Once installed, you will see Gladinet as a “Z” drive on your computer. The Professional Edition of Gladinet Cloud Desktop is an open platform, with advanced features that provide seamless integration of cloud services with your desktop. These include advanced backup capabilities, enhanced security, compression, chunking, and ever-expanding support for integrated cloud storage. Gladinet Professional also leverages an ever-growing set of storage plugins that have been developed by either Gladinet or third parties. Plugins that are registered in the online Gladinet plugin directory may be downloaded on demand. Gladinet is accessed through its Quick Launch Pad. Broadband speeds vary from around 100KB/s to 800KB/s. A response time of <5s is required for good usability for direct access. This means direct random access to the cloud files with 500K to 4M in size will be very usable. Online backup is write once and seldom read. At this stage, the cloud storage can’t replace either the network attached storage or the local hard drive because of the speed, but it is perfect for backing up stuff. An interesting twist is to combine the first two cases by moving the access point from user’s desktop to a file server. Users can do direct random access on a network server while the network server is backed up by online storage. Gladinet’s forthcoming Cloud Gateway fits this use case. 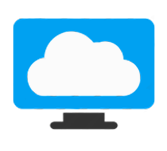 Cloud Gateway is an extension of the virtual drive concept from one user to many users, providing a central access point for external cloud storage services. After an administrator has configured Cloud Gateway, it will mount all configured storage and deliver it to Cloud Desktop users as if it were a file server. Smart caching for faster access . Cloud Gateway maintains local copies of the files stored by external cloud services. (This means that users usually have faster access to files at LAN speeds). Centralized administration . Users simply enter an IP address or DNS name and they are automatically connected to published storage. For example, Amazon S3 accounts can be configured at the Gateway and users will never need to know any account information, just the IP address of the Gateway server. Multiple offsite locations . These can be accessed as if they were locally stored on users’ desktops. Improved security . The attack surface is reduced by reducing the number of external connections required. While this is certainly a method (a simple one) of using cloud storage, and is one of the simplest ways to start making use of the cloud for storage, the applications themselves are not running on the cloud but on individual desktops.SMEStorage is a similar offering but at this writing, it does not support Microsoft Azure.